A MUST SEE before building. 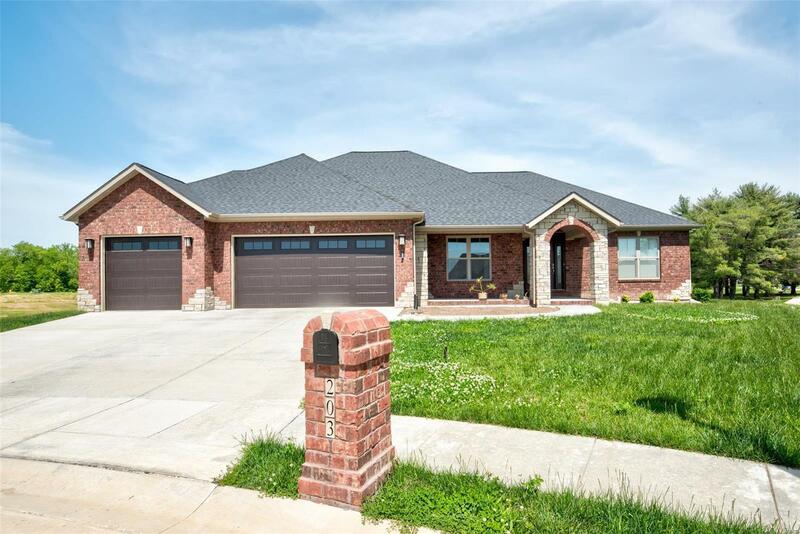 Open layout 4 bedroom, 4 bath, over 4,000 sq ft home in Mascoutah school district! Beautiful foyer leads to great room w/stack stone fireplace. Natural light filled kitchen offers stainless Kitchen Aid appliances, upgraded Frameless cabinets, quartz counters, large island w/sink, breakfast seating, separate dining nook & large walk-in pantry. Private office / dining off the foyer. The split master suite provides: massive walk in closet, spa like bath w/dual vanities, private commode & walkin tile shower. 2 guest rooms with jack / jill bath. Seperate Laundry & Â½ bath complete main level. Finished lookout basement includes: 9ft pour, family room w/wet bar & mini fridge, 4th bedroom, ceramic tiled bath, theater room, plus additional storage. Add'l feat: solar shades on every window, solid core doors throughout, composite covered deck w/ceiling fan, tankless gas water heater, Trane HVAC, 3 car garage w/wi-fi door openers, large fenced usable yard.